The parish hall was the first new structure built on the new site of our current church in 1975. Upon completion of the hall, Divine Liturgies were celebrated here until the main church structure was completed. Now the parish hall is host to many parish events such as our annual Yarmarok Pre-Christmas Festival Bazaar and the Ukraine Carassauga pavillion, as well as Easter and Theophany dinners when the hall is filled to capacity with our parishioners. 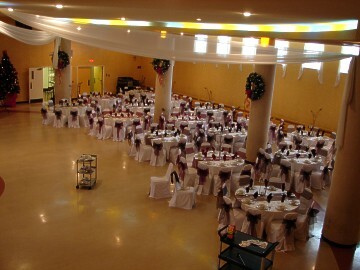 The Parish hall is also rented out to individuals and organizations, availability allowing, for functions such as weddings, dances and New Year's Gala events! 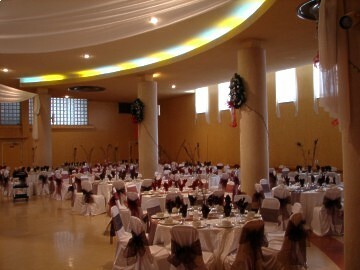 Prices depend on days of the week, size and utilization of the hall. Please contact our parish office during office hours for further details. Hall tours can also be arranged with the parish office. Hall capacity is 540 people. 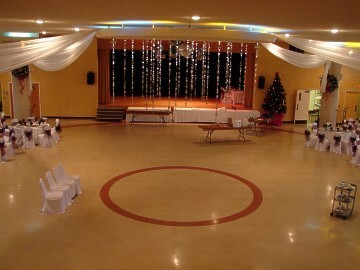 Round tables can be laid out for banquet or dance purposes. 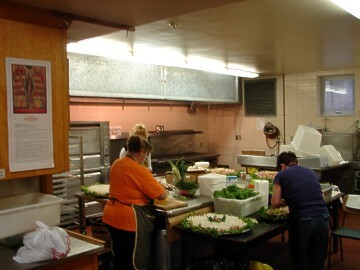 Long tables are also available but rarely used extensively. We do not supply linens nor wineglasses, but our fully stocked modern kitchen includes cooking, serving and dinnerware for a capacity crowd. Important Notice: Since the parish hall is located under the church proper there are certain time constraints on music and louder activities. A prime example of this is no loud activities Saturday evening between 4:45 and 6:00 during the English language Liturgy. Most events tend to start later, there are rarely any issues that cannot be resolved.